ATN NVWSMRS630 MARS6x-3 Night Vision Weapon Scope FREE SHIPPING! Named after the Roman god of war, the new MARS 6x-3 Night Vision Weapon Scope from ATN is a testament to human engineering and the power of technology. Featuring fully-coated optics and a powerful, internal nighttime imaging computer, the weapon scope offers unparalleled vision clarity no matter what the environment. The unique combination of premium components and light maximizing technology utilize all available peripheral rays to deliver a clear and easy-to-read sight picture day or night. When no light is available, a long-range infrared projector provides the necessary fill light to see clear as day. The scope's impressive 6x zoom makes spotting targets from further ranges easier than ever. A durable exoskeleton housing provides superior resilience needed to withstand the harsh conditions the come with tactical mission work. The scope has been nitrogen-purged and sealed with high-quality O-rings to ensure fog and waterproof use, day in and day out. 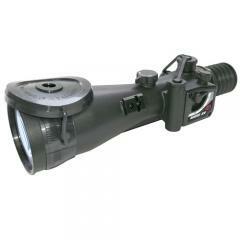 ©2002-2019 CopsPlus.com: ATN NVWSMRS630 MARS6x-3 Night Vision Weapon Scope FREE SHIPPING!